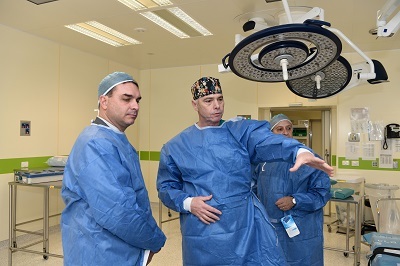 Prof Rotstein, who is a cardiologist, together with the Cardiology Department Director Dr. Refat Jabara, showed the visitors around the Irma and Paul Milstein Heart Center, one of the most advanced in the world. L to R: Dr. Refat Jabara,Director of the Cardiology dept. 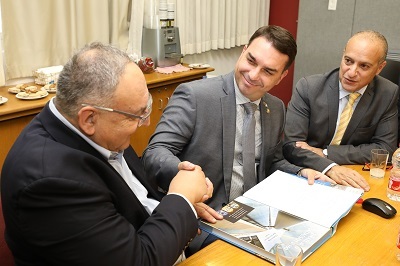 ; Prof. Zeev Rotstein, Director General of HMO; and Senator Flavio Bolsonaro. Pediatric Intensive Care Unit Director Jacques Braun (left) and EEC technician Camilla Kadosh (right) with Jorge Diener, Prof. Rotstein and Senator Bolsonaro. The delegation then went four floors below ground and toured the extensive, secure operating rooms. They observed a transplant surgery in progress and a trauma burn case. 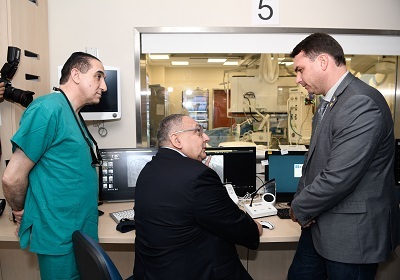 Prof. Alon Pikarsky, Head of Surgery at Hadassah shows some features in the advanced Operating Room in the Sarah Wetsman Hospital Tower to Senator Bolsonaro. As he was walked around the hospital, Senator Bolsonaro was very impressed by the combination of technology, research and the level of the medical doctors that make Hadassah unique. He remarked about the level of cleanliness, organization, technology and research that is exceptional for a public hospital in most parts of the world, and something that Brazil aspires to implementing, and would like to work cooperatively with Hadassah to make this a reality. 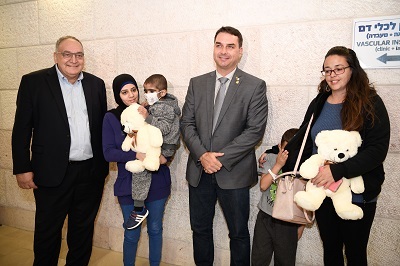 Senator Bolsonaro presents big white teddy bears to two children who are patients at Hadassah. Said Senator Bolsonaro, “I am so impressed with what I’ve seen here today. The mix of people of all religions, of Jews and Christians and Moslems, Israelis and Palestinians both as patients and staff members is such a positive example of togetherness. 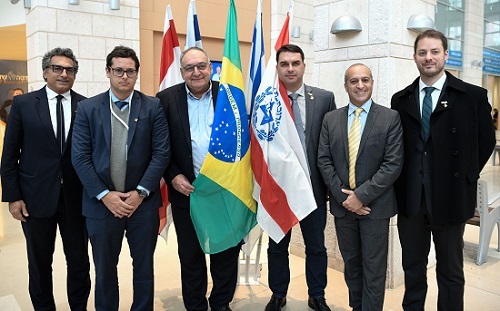 Photo at top of article: Brazilian Jewish community leader’s Meyer Nigri and Victor Metta together with Fabio Wajngarten, President of Hadassah Brazil next to Prof. Zeev Rotstein, Director General of Hadassah Medical Organization, (holding the Brazilian flag); and Jorge Diener, Hadassah International Associate Director next to Brazilian Senator Flavio Bolsonaro (holding the Hadassah flag). 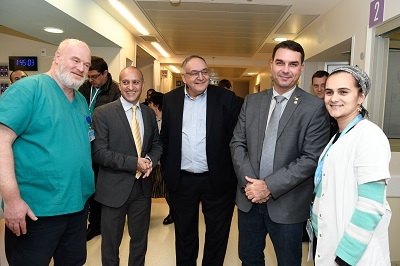 “Visit to Hadassah, the largest public hospital in Israel, where innovative technologies and a proposed knowledge exchange for health in Brazil were presented.